Lets Go Out gives quality of life mixed with an beautiful and elegant design. It is light and elegant, both in use and when it is folded. It has a cross folding which makes it easy to fold and it takes little space and can stand for itself when it is folded. Big front and rear wheels make it easy to get over kerbs and other obstacles. Even more important is the spring system in the wheels that gives a smooth movement compensating for stiff joints. Lets Go Out has soft, comfortable rubber handles, adjustable in height from 78 to 96 cms to fit different body lengths, It has an easy manageable brake which of course can be locked. There is a comfortable leather effect seat and it has an elegant design in all details and as a whole. Included is a specifically designed bag which can be attached easily to the rollator as well being used as a normal bag with carry handles. 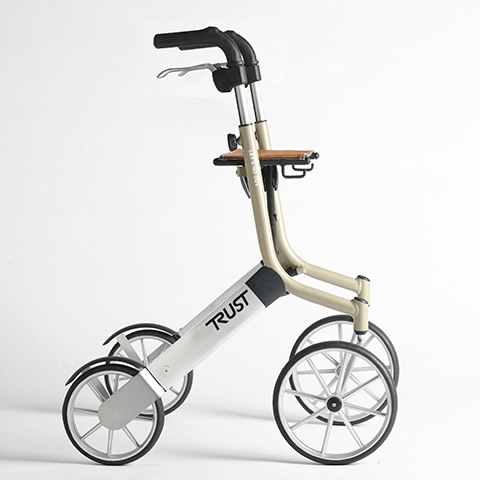 Optional extras available include a back strap in a choice of colours depending on the original colour style of rollator chosen, a crutch holder and a tray which fits onto the seat.